The visuals for this design and print website were provided by the client themselves – We were tasked with turning the visuals into a working website. 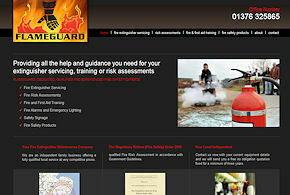 This fire protection company asked us to come up with an easy to navigate and straight forward design, and then construct the resultant website. 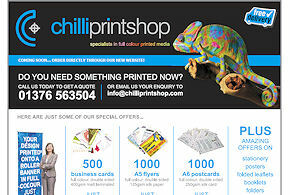 They particularly wanted to utilise animated imagery on their site. 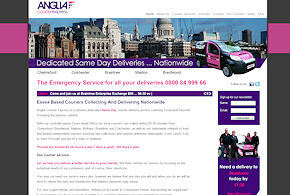 We were tasked with designing and developing a website for this Courier company. Additionally the site was to be maintained via a custom CMS. Also be sure to check out the clever location and time widget! 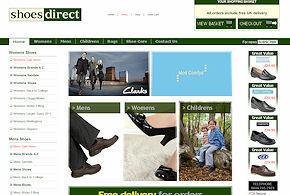 Shoes Direct have been our clients since 1999, and we have been designing, redesigning and redeveloping their website ever since. In 2001 they became our first e-commerce site, back when they were an unusual occurence on the Internet. 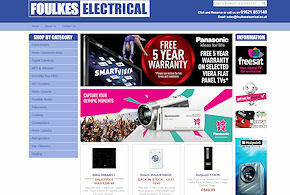 Foulkes Electrical are a local electrical retailer whose brief was to create a clean and easy-to-navigate design, and to allow the customer to upload their own products when needed. It allows advanced features such as setting warranty prices, manufacturer, model, etc. The customer can even create new categories and manufacturers, meaning all aspects of the site can be controlled by themselves. 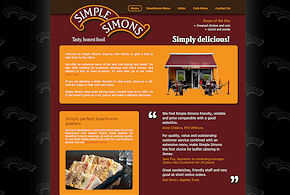 We were presented with a design for Simple Simons and asked to transform it into a working website with a custom content management system. This allows them to change their menu, and even have daily specials show on the site. Also included was an option to allow customers to order from the site itself.